William Cook, MD, of The Women's Specialists of Fayette in Fayetteville, Georgia, started practice at Piedmont Hospital in Atlanta in 1989 after completing medical school at the University of Michigan and residency in OB/GYN at the University of Chicago. He has held many leadership roles within the Piedmont system, including being the first elected President of the Medical staff at Piedmont Fayette Hospital and the Chief of Department for Women’s Services in the first 2 years of maternity services at Fayette. In 2006, as the maternity services were just beginning at Fayette, he founded The Women’s Specialists of Fayette. Dr. Cook has delivered over 4000 babies and with his partners has helped in managing many more pregnancies. His experience covers the full spectrum from low risk, all natural pregnancies to high-risk pregnancies complicated by co-existing medical problems or multiple gestations. Dr. Cook has remained at the cutting edge of gynecologic care, from surgical innovations to medical advances and alternative approaches. He and his partners have taken minimally invasive gynecologic surgery beyond the robot. Single site laparoscopy, a technique in which he and his partners have developed a great deal of experience and expertise, offers patients a wide array of relatively complicated surgeries that can all be done through a single belly button incision as an outpatient. 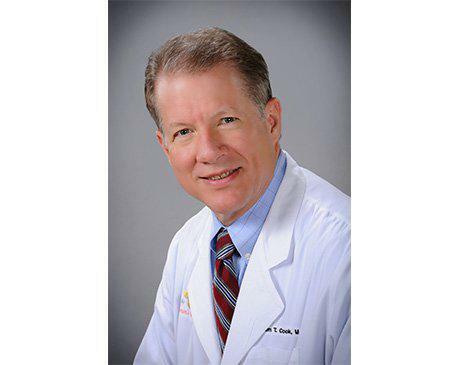 Dr. Cook also has extensive experience with pelvic prolapse repair surgery, urinary incontinence surgery, and nonsurgical management for these types of problem. Dr. Cook has been a volunteer physician at Grant Park Family Clinic in Atlanta where he has provided prenatal and gynecologic care for impoverished women in the metro area since 1992. He is also a preceptor for the Physician Assistant program at Mercer University, giving students one on one proctoring for their rotation in Women’s Health. Dr. and Mrs. Cook have been happily married since 1985. They have lived in Peachtree City since 1995. They have 3 grown children and one grandchild.